Lets add some green colours to my free wallpaper collection. This image is from the mossiest place I have ever been to: Lower McLeans Falls in New Zealand. 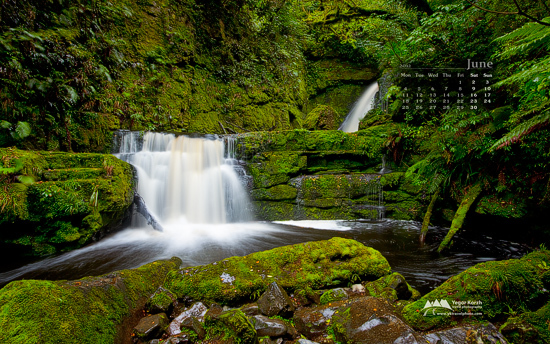 Windows 7 themes and all wallpapers with fresh calendar are available for download here: Free Desktop Wallpaper Calendars. Android users can enjoy over 100 images from my portfolio as high-resolution wallpapers for Android devices. App allows access to Flickr, Facebook and Picasa, so you can use your own images as well as images from my portfolio as wallpapers for your Android. Every time when I visit my relatives and friends in Kiev, Ukraine, I spend most of my free time (…well … free from drinks, restaurants and etc…) with camera trying to come up with some images of my home town. Unfortunately, I must say that I’m not satisfied with most of the images I produce there. Don’t know why – I just don’t like them. Maybe it is amount of advertising on streets which covers about 50% of most buildings, or modern architecture, that destroys 1500 year old city, or maybe I just don’t like street photography. This image is one of very few which I like and happy to share, funny that it features very dense fog and you can’t see much there. 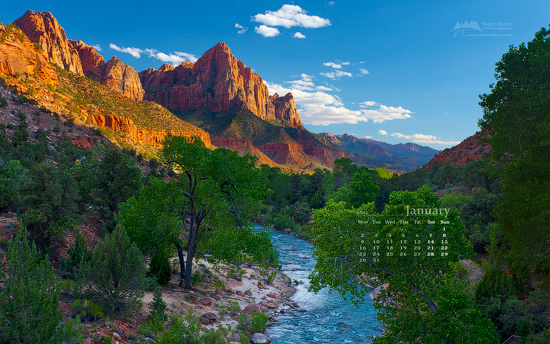 Windows themes and all wallpapers with fresh calendar are available for download here: Free Desktop Wallpaper Calendars. Android users can enjoy over 100 images from my portfolio as high-resolution wallpapers for Android devices. App allows access to Flickr, Facebook and Picasa, so you can use your own images as well as images from my portfolio as wallpapers for your Android. 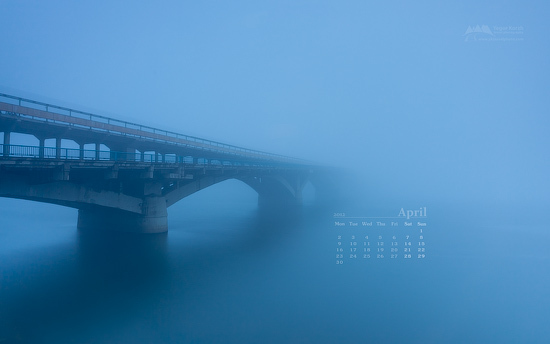 With this new wallpaper I’d like to announce a new way to access my calendar collection from Windows 7 PCs – desktop slide shows. All you need to do is to download a theme file, open it and tell Windows that you want to download all images from the feed. By default, slideshow will wait for 30 minutes between images, but you can change this interval in your windows desktop settings. 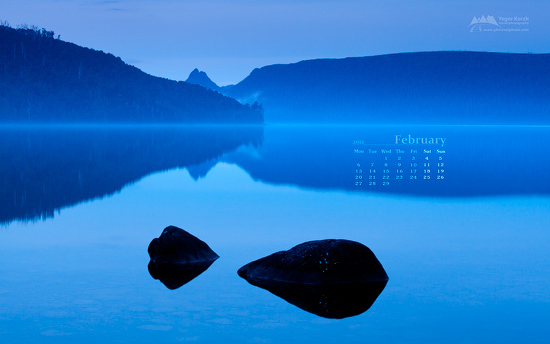 Slideshow automatically downloads calendars for a current month. I’d like to do the same for other platforms, especially Mac OS, however I couldn’t find an easy way to implement it and it looks like I’ll have to write an app for Mac users. If you know a reasonably easy way to create a desktop slideshow with automatic image downloads on Mac – please let me know. This photo with an iconic view of the Watchman from Zion National Park was made back in 2009. I remember trying to process it 2 or 3 times, but I didn’t like the result. This latest attempt is more or less close to what I wanted to achieve. I wish you all a Merry Christmas and a very Happy New Year! This and all previously posted wallpapers with fresh calendar are available for download here: Free Desktop Wallpaper Calendars. I’m also offering over 100 images from my portfolio as high-resolution wallpapers for Android devices. App allows access to Flickr, Facebook and Picasa, so you can use your own images as well as images from my portfolio as wallpapers for your Android. 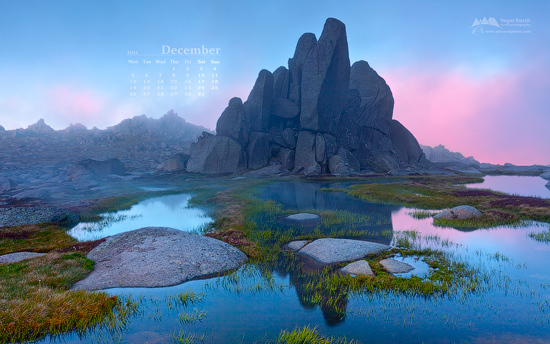 As I can’t think of anything except my backpacking trip to Tasmania which starts later this week, the fresh desktop calendar features an image from my last year’s hike in Australian Snowy Mountains. The Rams Head plateau is located a few kilometres south of Australian tallest mountain (Mount Kosciuszko, 2228m) and offers stunning scenery over grassy flats mixed with impressive granite boulders and rocky outcrops. Despite its close location to an extremely popular walking track, there are not many people who decide to take a side walk and visit this remarkable place, making it even more attractive. As before, this and all previously posted wallpapers with fresh calendar are available for download here: Free Desktop Wallpaper Calendars. On top of these free wallpapers, I’m offering over 100 images from my portfolio as high-resolution wallpapers for Android devices. App also allows access to Flickr, Facebook and Picasa, so you can use your own images as well as images from my portfolio as wallpapers for your Android.